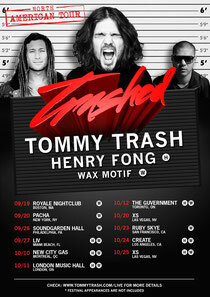 Having played Las Vegas and Miami early this year with his “Trashed” events, Tommy Trash is ready to bring the party on the road this autumn/fall for the first time ever. Following the release of his single 'Lord Of The Trance' (one of the top five most played tracks at Tomorrowland) and a heavy summer festival schedule consisting of Electric Daisy Carnival (Vegas and NYC), HARD Summer, Tomorrowland, and Creamfields amongst others, Tommy is hitting a number of North America's top clubs in September and October. Joining Tommy on tour for select dates will be Henry Fong and Wax Motif, two of his closest DJ friends and rising performers in the dance music scene. Henry Fong is having a big year with a number of chart-topping releases such as ‘Stand Up’, ‘Encore’ and ‘Slapjack’ alongside debut performances at some of the world’s largest dance music festivals. Wax Motif recently garnered attention for his releases from some of the biggest names in dance music including Tiësto, Steve Aoki, Nicky Romero and Destructo, to name a few. Be on the lookout for two upcoming Tommy Trash collaborations with both of these guys. Having debuted Trashed at his Las Vegas residency, Tommy brought the party to Miami in March. Now, according to the man himself, "This year I want to bring Trashed to you; this is only the beginning."